Thank you for thinking about working with Tilly and I at Being Tilly's Mummy. Firstly lets talk about what I like talking about best ..... ME. I started my blog in March 2013 when I realised that my daughters birthday was approaching and it was the first birthday I actually looked forward to since I had suffered from Post Natal Psychosis. As I was well on the road to recovery I wanted to share my achievements and my life as Being Tillys Mummy with the world. Nearly 5 years later, here I am with an amazing growth and I love that people read my ramblings. Tilly works really closely on my blog with me and she loves to be involved in the reviews - She is an extremely lucky girl. 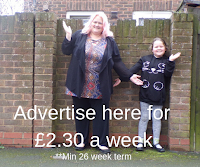 She is 7 now and is open to any idea's for products to review and events to enjoy.. We blog about a whole variety of things and, as long as it fits in with the blog, we are willing to try anything. Tilly has kind of grown up on the blog and has developed a love for it herself and now yearns to travel all the time! My older daughter, Kim has also started a blog now after helping out on mine a few times. you can find her at www.memylifeandthetardis.co.uk and you can find Tillys little YouTube channel here at Being Tilly. We are just a normal family with a lot to say and are always looking for the next adventure, will it be with you?